“Our government has taken its information from the wind industry, CanWEA, instead of doing its own homework. In fact, the first name on the first draft of the Green Energy Act, the act that stripped municipalities of any say in wind turbine installations, is OSEA, the Ontario Sustainable Energy Association, made up of mainly wind industry people. I’m the lead for WindVOiCe, (Wind Vigilance for Ontario Communities) a self reporting health survey sent out, by request, to people living in proximity to turbines. I’m asked to send the survey to people who live anywhere from 400 metres to over 2 kilometres from industrial wind turbines and I’m asked to send them to every wind project in southern Ontario. Many welcomed “green energy” into their community, although some felt unease at a 400-foot tower with its massive base being placed so close to their home. They were reassured by the wind company that the turbines were as quiet as a whisper in a library and would be no trouble. First comes the construction period with loads and loads of concrete, steel, transportation of massive turbine parts, new transmission lines, access roads and transformer stations. Then the turbines start up. Some people have problems immediately, some find it takes days, weeks or a few months to start to feel the effects. Symptoms dissipate or disappear when they leave their home but return when they go back. The people who are home the most tend to feel the effects quickly and more severely; stay at home moms, young children, retired people, people working from home, but it most certainly isn’t limited to that group. The #1 problem is sleep deprivation night after night after night from both audible noise and from a “humming” that seems to come up through the pillow. The severity of this changes with the weather and wind speed. Other problems that many experience are headaches, tinnitus, unexplained anxiety, muscle and joint aches and hypertensive episodes. Some talk about feeling their own heart trying to beat in time with the rotating turbines. Some have sores that won’t heal, earaches and chest pain. Why don’t these people just tell the authorities about what is going on? We have regulations and standards in Ontario, don’t we? People who are brave enough to come forward to say that wind turbines are causing problems are told they are the only family having a problem, that they are overly sensitive or chronic complainers. Sound tests drag on for weeks, then months as the person’s health deteriorates by increments every day. I have personally seen two noise test results, the testing done by wind company testers, well over compliance for sound allowed. The results were dismissed. Our government has taken their information from the wind industry, CanWEA, instead of doing its own homework. 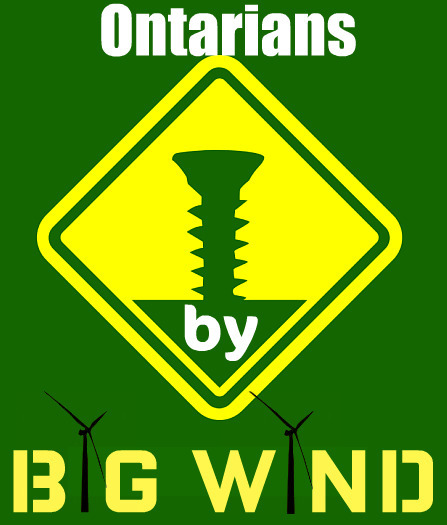 In fact, the first name on the first draft of the Green Energy Act, the act that stripped municipalities of any say in wind turbine installations, is OSEA, the Ontario Sustainable Energy Association, made up of mainly wind industry people. There is constant denial of adverse health effects from the wind industry and this government is allowing them to make those claims. What the wind industry uses to deny adverse health effects is engineering noise modeling and literature review. Neither the government nor the wind industry has a proper study on human beings by health professionals in spite of repeated requests for just this action from over 40 municipalities, the OFA, health units and hundreds of individuals. There are under 700 turbines currently operating in Ontario at this time. Over 100 people have taken the time to fill in a three-page survey and mail it to me. I’ve lost track of the number of people who haven’t filled out a survey but who have called or e-mailed to tell me of the problems they are having with their health since the start-up of turbines in their area. I have no idea how many families have quietly moved away. I don’t know how many can’t afford to do that and are trying to cope any way they can, some by sleeping in a tent or in their vehicle, some by renting another place or by staying with family. Those experiencing health difficulties and having to find another place to sleep or recover includes people who have turbines on their farms. We absolutely cannot accept this as the future of rural Ontario.